The sun was shining today – hooray! Despite a big thunderstorm this afternoon, I really enjoyed having some time off in the (intermittent) sunshine and made the most of a full day of shopping! H&M currently has some nice satchel-style bags – I saw a bag in a lovely lemony shade of yellow today for £24.99 and there’s a zingy orange messenger bag available online – a vibrant, citrus-like shade. There are lots of bright orange clothes and accessories about too – I particularly like the Next orange cotton jacket, which is also available in Petite sizes for petite people like me! Would look great with black trousers or skirt, or jeans. And the tuxedo-style jacket in Miss Selfridge is fun and affordable – would look great with some slim black trousers and a black vest top. And for a special occasion (perfect for weddings, Christenings and other summery events), I am completely in love with this beautiful orange lace pleated dress (called “Butterfly” – how appropriate!) from Reiss. Red – traditionally the colour of power, confidence, and my favourite food – tomatoes! Boden has some great choices in red too, depending on your chosen shade and size of bag – there are more traditional satchel styles and I also really like the Classic Colourful Tote. Vivienne Westwood, as always, has some fantastic red bags like this beauty I was eyeing up today, and I fell head over heels (pun intended!) in love with a far less practical but oh-so fabulous pair of shoes today – Melissa for Vivienne Westwood Anglomania Skyscraper – 5-inch round-toed heels in beautiful, bright red! Ah, trying not to drool into my tea…! For high street bargains, head to New Look – they have a lovely 20s-inspired clutch (ticking the boxes for yet another trend…) for only £6.99 (yes, you did read that correctly! ), and even that all-important iPad case by Fiorelli (available online). Electric blue and turquoise are my favourite colours – have been ever since my teens – and I already have a lot of clothes and accessories in varying shades. There are lots of electric blue jeans, blouses etc on the high street, so you’re really spoiled for choice is this is your chosen colour. Gap, TopShop and Warehouse all have good ranges and there’s something to suit all styles, shapes and sizes. It’s a colour that pretty much suits everyone, too. 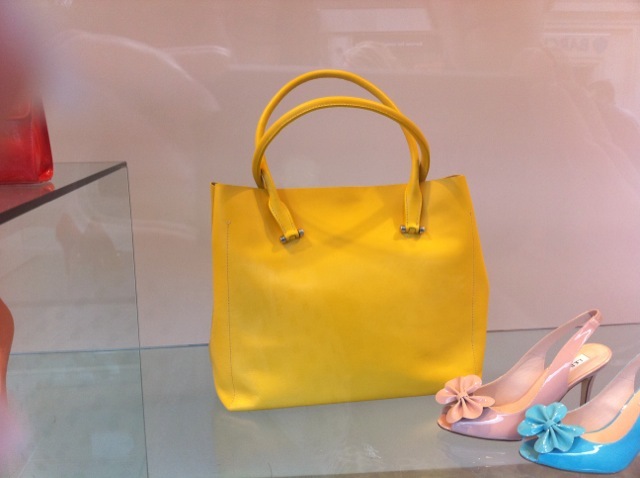 This entry was posted in Fashion and tagged accessories, bags, belts, fashion, high street, Personal shopper, shoes, shopping, shops, Spring/Summer 2013, wardrobe by Rachael. Bookmark the permalink.